The Federal Reserve did not raise rates in its meeting Wednesday and dramatically downgraded its expected rate path to signal that no rate hikes are likely in 2019. 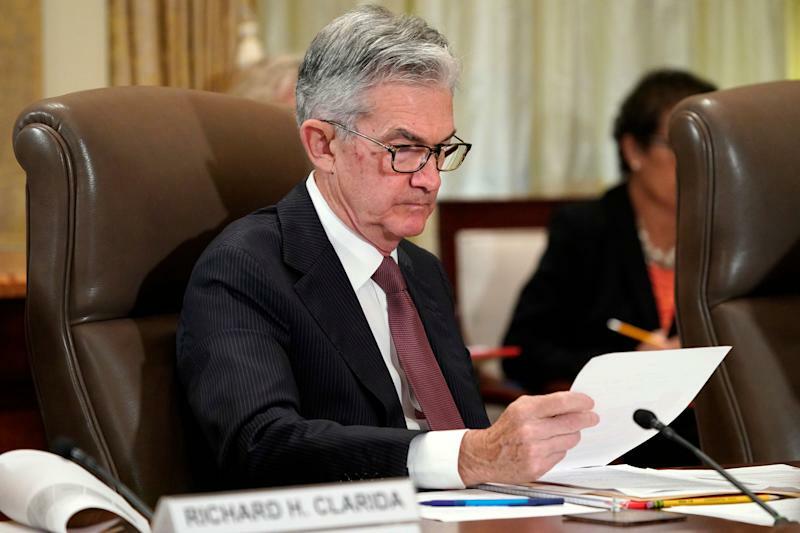 At the conclusion of its Federal Open Market Committee meeting, the Fed also announced that it will slow the rolloff of its balance sheet in May and then conclude its reduction at the end of September. In keeping interest rates steady at the current target range of 2.25% to 2.5%, the Fed said said that the labor market "remains strong" but said economic growth has "slowed from its solid rate in the fourth quarter." The Fed statement said indicators have pointed to "slower growth" of household spending and business fixed investment. The decision to hold rates steady was widely expected; fed funds futures headed into the meeting priced in a 98.7% chance of keeping rates where they are. The FOMC's summary of economic projections reflected toward revisions across the board as policymakers dampen their expectations for rate hikes in the future. 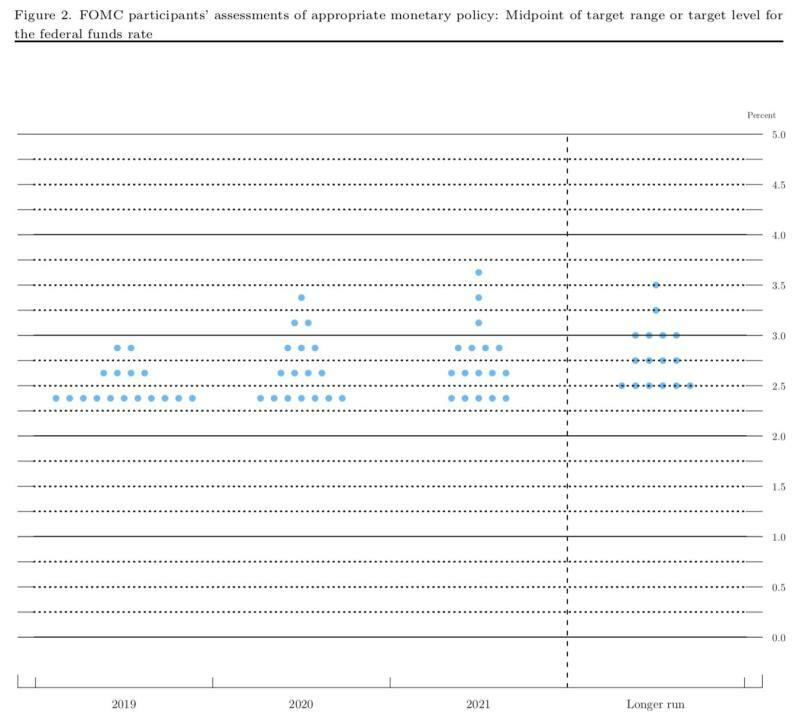 The "dot plots," which chart FOMC voters' estimates for where they feel benchmark interest rates should be in the next three years, had the median dot for 2019 at the current level of 2.25% to 2.5%. That view — that no rate hikes would be appropriate for 2019 — came from an overwhelming majority of participants: 11 out of 17. For 2020, the median dot sits only 25 basis points above that level, telegraphing that only one rate hike could be in the cards through the end of next year. Those projections are a significant downward revision from the December FOMC meeting where policymakers raised by 25 basis points and said the economy could absorb "some further gradual increases." For comparison, the median dots in the December dot plot signaled two rate hikes for 2019 and a third in 2020. The lower outlook on rates falls in line with the Fed's slightly lower expectations for GDP growth. For 2019, the Fed brought down its median projection for GDP growth from 2.3% to 2.1%. The Fed also raised its 2019 median estimate for unemployment from 3.5% to 3.7%. The median estimate for inflation, which has persistently floated below the Fed's 2% target, was brought down from 1.9% to 1.8% for 2019. In its policy statement, the Fed said overall inflation "has declined," which is new language compared to its January statement. The Fed added that market-based measures of inflation compensation have "remained low in recent months." Inflation has been in view ever since the Fed's January meeting where it shifted dovish, reiterating the need for patience as it assesses the development of "muted" inflation pressures in addition to geopolitical concerns abroad. The Federal Reserve also followed through on its plans to announce more detail on the timing of its balance sheet normalization process. In May, the Fed plans on slowing the reduction of its holdings of Treasury securities. Currently the Fed is allowing redemptions on $30 billion of Treasuries a month, which it will slow to $15 billion. The Fed says by the end of September, the Fed will conclude the reduction of its securities holdings. A statement added that at that point in time, the Fed will have a balance sheet that will "likely still be somewhat above the level of reserves necessary to efficiently and effectively implement monetary policy." With more clarity on the size of the balance sheet, the next step for the Fed will be deciding its ultimate composition. Some Fed officials have advocated for a more "neutral" balance sheet skewed toward shorter-term Treasurys in place of the Fed's current longer-term Treasury and agency debt and mortgage-backed securities holdings. The Fed says it will continue to let its agency debt and agency MBS holdings decline, adding that in October of this year principal payments from those securities will be reinvested in Treasuries at a maximum amount of $20 billion per month. The Fed said it could be "warranted in the longer run" to engage in limited sales of agency MBS.